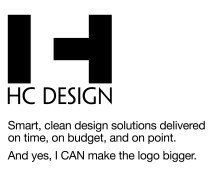 HC Design | Smart, clean design solutions delivered on time, on budget, and on point. And yes, I CAN make the logo bigger. Smart, clean design solutions delivered on time, on budget, and on point. And yes, I CAN make the logo bigger.